Oakland Athletics general manager Billy Beane before Game 1 of the American League division baseball series between the Detroit Tigers and the Oakland Athletics, Saturday, Oct. 6, 2012, in Detroit. Beane may not be the highest-paid GM in the history of sports, but he may be the most famous. An outfielder originally drafted 23rd overall by the New York Mets in 1980, Beane made his MLB debut in 1984, but was never successful against top competition. After getting washed out of the league, he became a scout for the A’s and eventually worked his way up to GM in 1997. As GM, he has used Bill James-style advanced statistics to inform his decisions, and taken a strictly economic approach to valuing and acquiring players. Under his leadership, the A’s have been a very successful franchise despite routinely carrying one of baseball’s smallest payrolls. Beane’s story caught the attention of author Michael Lewis, who made him the central character in his 2003 bestseller “Moneyball” and something of a cultural icon for sports analytics. Beane has been a godsend to the frugal A’s, enabling them to achieve top-tier performance at bottom-tier prices. For this, the A’s have paid him fairly modestly4 — but since we don’t know how much winning is worth to the A’s organization, it’s hard to say exactly how much Beane has been worth to them. For a team like the Red Sox, however, the picture is much more clear. Over the last 15 years, they’ve happily spent over $2 billion in the pursuit of wins — and because they’re one of baseball’s most successful franchises, no one in Beantown is complaining. From a strictly economic perspective, not offering Beane however much money it took to get him may have been one of the Red Sox’s poorest decisions since letting Babe Ruth go to the Yankees for next to nothing. And I mean that literally: Over the past 15 years, Billy Beane has been nothing less than the Babe Ruth of baseball GMs. The Red Sox offered Beane $2.5 million per year,5 but even $25 million would have been a bargain. To show this, we first we need to figure out just how many A’s wins Beane has been responsible for, and how much those wins would cost on the open market. 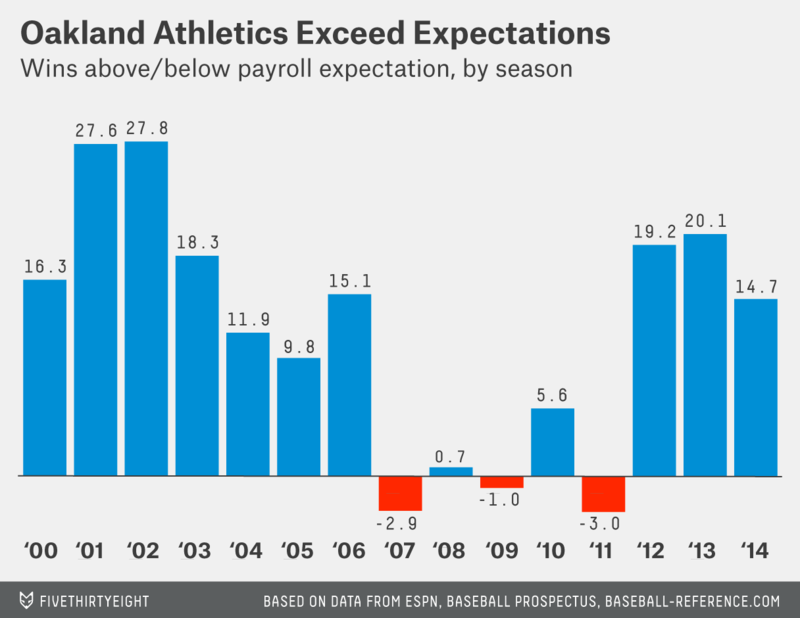 The point on the upper right represents the 15 team-seasons with the highest relative payrolls. 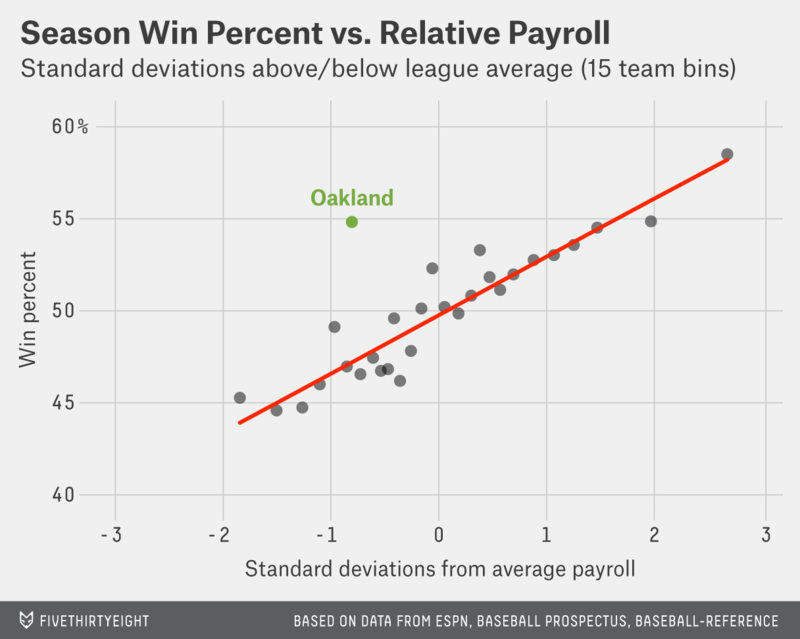 These teams were 2.68 standard deviations above the mean payroll on average and won 58.5 percent of their regular-season games on average.9 Oakland, on the other hand, averaged .81 standard deviations below the mean payroll and won 54.8 percent of its games on average. This comes out to 180.2 wins above expectation given the A’s payroll (165.5 prior to this year). 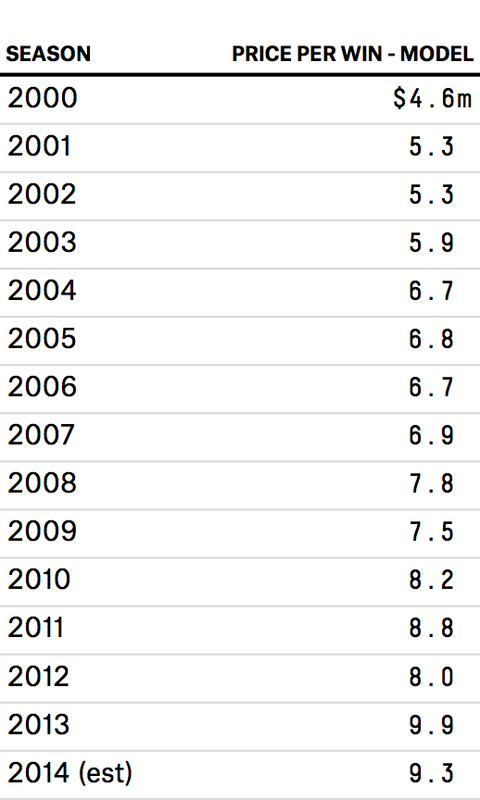 That’s 12.0 wins above expectation per season (and there’s a good chance of that per-season average rising). Beane’s 12 wins per season above what we would expect of an average general manager is slightly more wins than Barry Bonds earned when he hit 73 home runs in 2001 (11.9 WAR). The most WAR earned by any batter over his entire career was 163 by Babe Ruth.12 In fact, if you assemble the top 15 position player seasons of all time, they still trail Beane’s 15 seasons as GM, with 180.1 WAR combined versus Beane’s 180.2 wins above expectation. No one can get that lucky. If you’re expected to win 1,116 out of 2,364 games, winning 1,296 games instead may not look impossible, but that’s because our intuitions about these things are terrible. Excel’s binomial distribution function makes calculating such odds pretty easy:13 In this case they’re somewhere around one in 13 trillion — effectively zero.14 Of course, we can’t know to what degree Beane alone is responsible for the A’s success. But as GM, Beane is formally responsible for the A’s performance, and there aren’t any other obvious causes that would suggest he isn’t responsible (there have been several different managers and 100 percent turnover of players during Beane’s tenure). Imagine the A’s wanted to have exactly this level of success and were willing to pay whatever it cost. With Billy Beane, the A’s have paid $839,902,108 to their players from 2000 up to and including the start of the 2014 season (but prior to recent acquisitions). How much do other teams normally have to pay for this level of success? 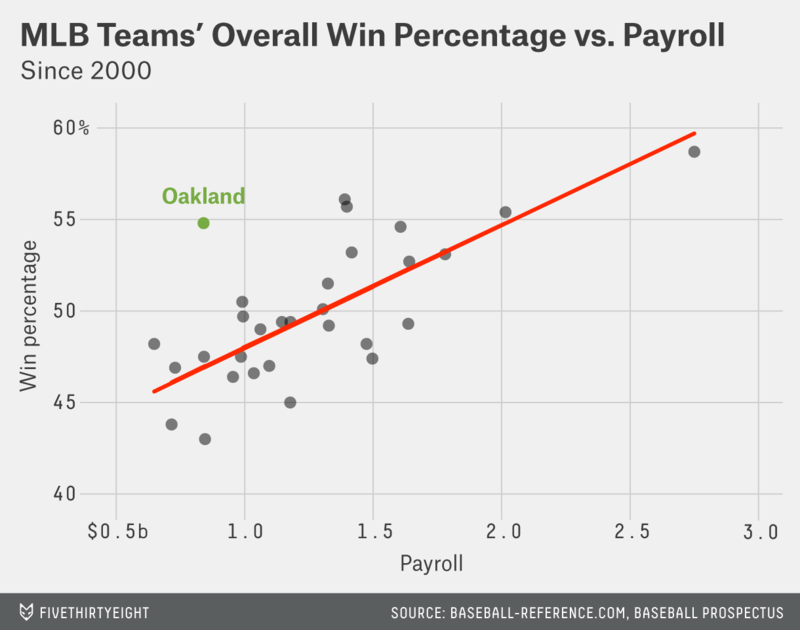 That trend line shows us how well teams have performed relative to how much they’ve paid, but we can also use it for the reverse:16 The Oakland Athletics have won 54.8 percent of their games, so the corresponding 15-year payroll (the amount we would expect a team to have paid for that win rate) is about $2.02 billion — about $1.18 billion higher than the Athletics actually paid. So the smell-check turned out a higher number than the estimates based on the normal price of wins, when that normal price already seemed absurd. Now that we have a sense of Beane’s performance and how much it would cost to replicate it, let’s turn back to the Boston Red Sox and their failure to sign him (or even to offer him anywhere near his worth). The situations in Oakland and Boston aren’t directly comparable. Exploiting market inefficiencies is probably easier for Beane than it is for a successful big-money team, because he has never had to face the winner’s curse or the diminishing returns of spending. On the other hand, the A’s have been way above average, not just a little above average. Aside from the Red Sox’s post-season successes,19 the team has only performed 0.6 percent better than the A’s over the 15-year period — for which they’ve paid an extra $1.2 billion in salaries. If we combine these — the price of the A’s performance ($736 million) plus Super-Expensive-Billy-Beane’s salary ($300 million) plus the additional 50 Red Sox wins at high market estimates ($370 million) — merely duplicating their previous level of success still would have saved the Red Sox more than $300 million relative to what they actually spent, and that’s with reasonably conservative assumptions. That’s money they could have pocketed, or spent making themselves even better. In other words, failing to understand Beane’s true value may have cost the Red Sox hundreds of millions of dollars or more. 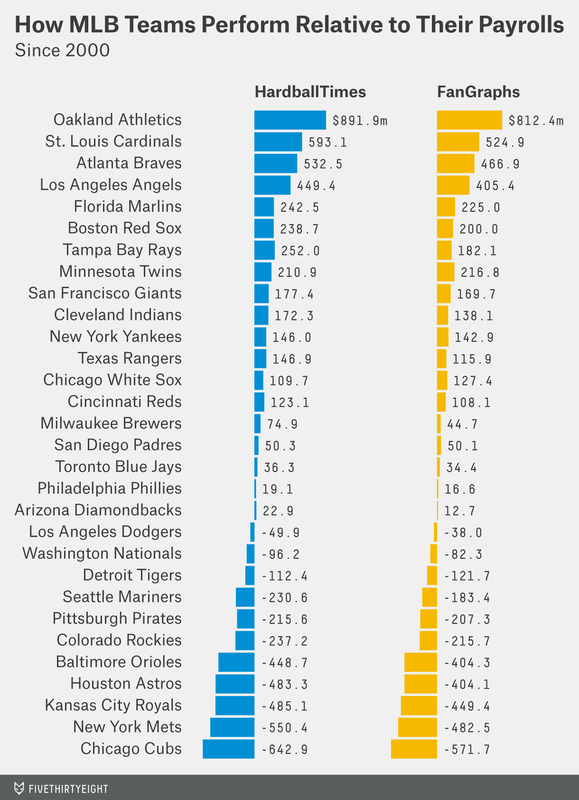 “Moneyball” isn’t just some nerdy obsession that helps a few teams save a bit of money. It’s about more than nickels and dimes; it’s about millions and billions. CORRECTION (July 24, 7:10 p.m.): A footnote in an earlier version of this story misstated the most recent year the Oakland A’s played in the World Series; it was 1990, not 1991. While also being rated as the “unluckiest” team this year. They currently lead MLB in Pythagorean wins by an even wider margin. 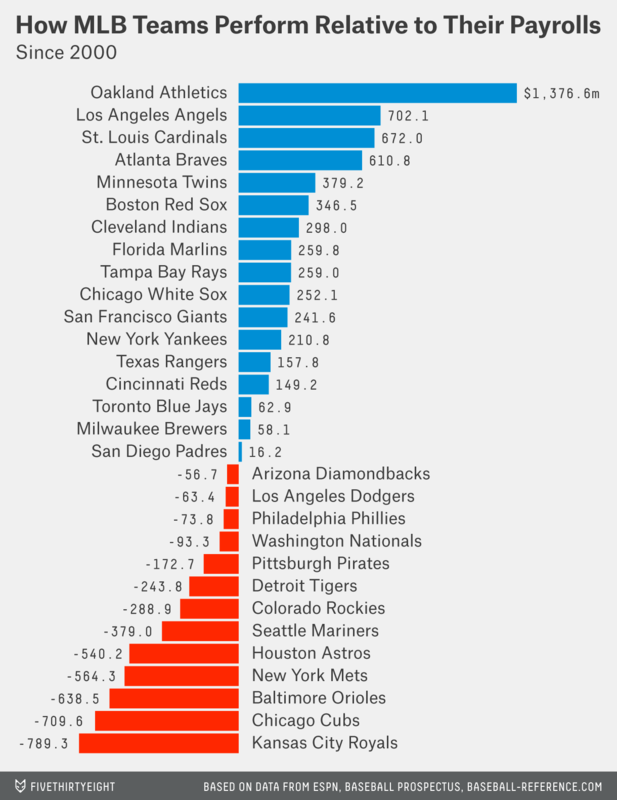 The period covered by Baseball Prospectus’s payroll data. In general, good GMs are probably way underpaid, but Beane is even more so. The 2002 Boston Red Sox paid Dustin Hermanson — a relief pitcher with a 4.21 ERA — $5.5 million, or more than twice as much in annual salary as they offered Beane. Hat tip to Jeremy Kahan — a hedge fund analyst and good friend of mine — for zeroing in on the Red Sox angle to this question. Prior to their change in ownership in 1995, the A’s maintained a healthy payroll, including the largest in the league in 1991, following their World Series appearance the year before. By the time they started downsizing, Beane was already with the team. This means there’s no way to compare Beane’s performance to that of a different A’s GM with a similar payroll. A type of model used to predict things like win percentages. Note there’s not much difference from a linear regression, which would have an underlying (season-by-season) R-squared value of .183 (though this can be increased by using less noisy metrics such as run differential). The logistic regression formula in Excel is: =1/(1+EXP(-(-0.009677+0.127212*[SD Payroll]))). WAR is based on direct player performance metrics like hitting, fielding, etc., while a general manager’s wins earned are imputed indirectly from his team’s performance (both of these methods have their pluses and minuses). WAR is above “replacement,” meaning it’s the number of wins a player earns not over an average player, but over a borderline player — someone you would pay the minimum. A GM’s wins here are measured above what we would expect from the average non-Beane GM. But the difference between a “replacement” GM and an average GM is unclear to me: They all cost a pretty similar amount, and how much value they add is a mystery, so I thought an average GM was the appropriate baseline. Regardless, this means that this comparison could be understating Beane’s value. For example, Babe Ruth earned only 126 wins above average as a batter, compared to his 163 wins above replacement. At least for now, Ruth does maintain a slight edge over Beane in total WAR (with 183.6) on account of his 20.6 WAR as a pitcher. The Excel formula to calculate odds of winning a certain amount given an expected win rate is: =BINOM.DIST([Games]-[Wins],[Games],1-[Expected Win Percent], TRUE). 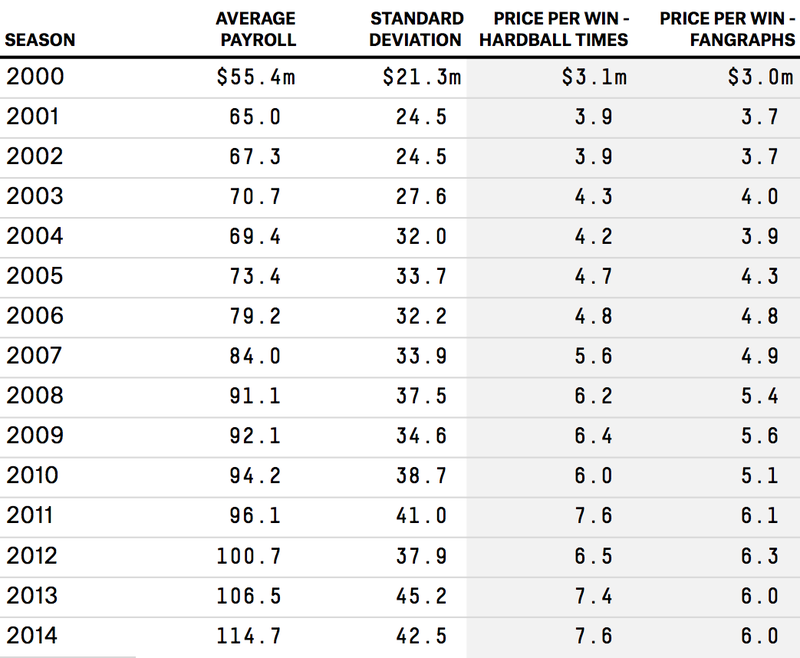 Granted, though odds that they’ve just gotten lucky overall are nil, it’s likely that the A’s have been “running well” to some extent — meaning, their performance has probably exceeded their true expectation. But this is true of any top team. I’ll stick with FanGraphs and Hardball Times, because their historical estimates are readily accessible. By solving for Win Percentage. In Excel: =([WPct]-0.4130893)/(0.0000669). I should note this leads to some very valuable-looking seasons (like Seattle’s 116-win season in 2001), because that kind of success is virtually impossible to “buy.” But it sums up across seasons very accurately. I should also note that, while not having any championships to show for it, the A’s have made the playoffs the same number of times the Red Sox have (seven), and they’ve been remarkably unlucky, losing all six series-deciding Game 5s they’ve played.